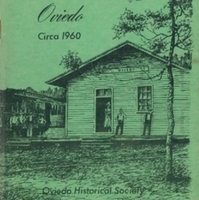 A booklet, compiled by the Oviedo Historical Society, featuring historic houses and buildings in Oviedo, Florida. The booklet features historic buildings constructed before 1960, just before the period of expanded housing developments in Oviedo. The oldest homes were constructed in the 1880s. Original 38-page booklet: Oviedo Historical Society. Oviedo, Circa 1960. 1982: Private Collection of Betty Reagan. Digital reproduction of original 28-page booklet: Oviedo Historical SocietyOviedo, Circa 1960. 1982. Originally published by the Oviedo Historical Society. “Oviedo, Circa 1960.” RICHES of Central Florida accessed April 19, 2019, https://richesmi.cah.ucf.edu/omeka/items/show/6204.